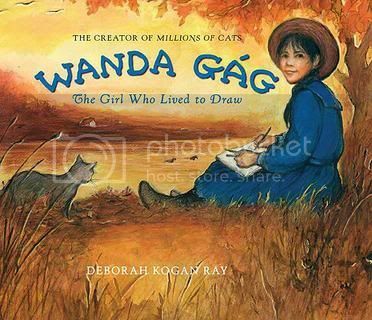 This is a nice picture book biography portrait of the author/illustrator of the beloved Caldecott winner Millions of Cats. Wanda Hazel Gág had a very hard life, losing her father to tuberculosis at age 15. Despite the hardships, she managed to support her six younger sisters on an artist's salary, retaining her cheerful disposition. Her exposure to German fairy tales, and the cozy family times inspired a lot of the tone and feel of her picture books. I think Ray may have exaggerated with the claim that Millions of Cats (first published in 1928) was "the first modern picture book." What about Beatrix Potter's Peter Rabbit (1902)? Randolph Caldecott's The Diverting History of John Gilpin (1878), although it is in a now-familiar picture book layout, is debatable as a "true" picture book since the storyline, about a drunken horse ride by the title character could arguably said to appeal to adults more than children. Nevertheless, it is the very book that inspired the Caldecott award which Gág was to later win. I also wondered about the claim that Gág invented double-page spread illustrations. Interestingly, the mixed media full-color soft charcoal illustrations in this biography were all single page, with accompanying wordy text opposite. These minor quibbles aside, this is a lovely book, and serves as a rallying call to anybody who has ever wanted to make a life for themselves in the arts. Looks interesting. I put a hold on it at the local library.